Phagocytes such as macrophages and neutrophils contain multiple lysosomes, which possess a variety of digestive enzymes. Upon stimulation, phagocytes secrete these digestive enzymes through a process called lysosomal exocytosis to lyse external pathogens or tumor cells. A research team led by investigators at Kanazawa University identified myoferlin as a critical regulator of this process. Furthermore, they found that it plays an important role in inducing cellular injury by phagocytes during inflammation (Figure 1). Lysosomes are filled with more than 50 different hydrolytic enzymes, which are capable of digesting most cellular components. Notably, activated phagocytes secrete lysosomal enzymes with cytotoxic activity against external pathogens or tumor cells, inducing heterolysis. However, the molecular mechanisms that regulate lysosomal exocytosis by phagocytes remain largely unknown. In several types of cells, transmembrane proteins possessing C2 domains, such as Munc13-4 and synaptotagmin-VII, are present on the lysosomal membrane and known to regulate Ca2+-triggered lysosomal exocytosis. C2 domains mediate Ca2+-dependent binding to phosphatidylserine (PS) in the inner leaflet of the plasma membrane, which is a critical process for membrane fusion. Myoferlin is a type II transmembrane protein with seven C2 domains in its cytoplasmic region. The first C2 domain (C2A domain) binds PS in a calcium-dependent manner. Myoferlin was first identified as a protein expressed in the plasma membrane of myoblasts undergoing fusion and has since been implicated in the repair of injured plasma membranes. Injury-induced Ca2+ influx through membrane lesions triggers endocytosis and the generation of endocytosed vesicles expressing myoferlin, which fuse with the injured membrane to yield a membrane patch. This characteristic of myoferlin led to the hypothesis that it may be a regulator of calcium-dependent lysosomal exocytosis by phagocytes. We found that myoferlin was highly expressed by macrophages and localized to lysosomes. Analysis of transformed cells expressing shRNA against myoferlin demonstrated that myoferlin knockdown cells contained significantly more lysosomes and cytoplasmic vesicles filled with debris and additional membranous materials compared with the control cells (Figure 2). The amount of lysosomal enzyme secreted after calcium stimulation was significantly impaired by myoferlin knockdown, but was restored by re-expressing myoferlin protein. Similarly, macrophages from myoferlin−/− mice also displayed accumulation of lysosomes and reduction of lysosomal enzyme secretion after various calcium stimuli. 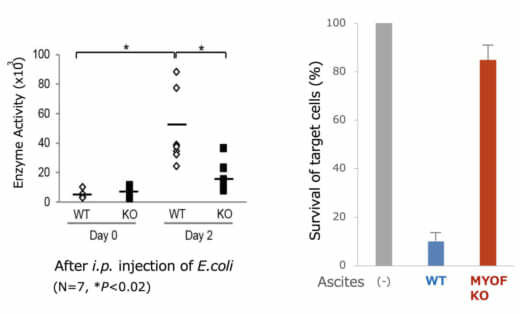 The injection of Escherichia coli BioParticles into control mice increased the amount of the lysosomal enzymes in the peritoneal fluid (ascites), which was inhibited in myoferlin−/− mice (Figure 3). Additionally, the peritoneal fluid had a cytotoxic effect when added into culture media of tumor cells, which was also attenuated in myoferlin−/− mice, consistent with the amount of lysosomal enzyme present. This study reveals that myoferlin is a Ca2+-dependent regulator of lysosomal exocytosis by phagocytes. As autolysosomes filled with debris accumulated in the myoferlin knockdown cells, we speculated that myoferlin on autolysosomes might promote expelling of indigestible debris generated inside autolysosomes via exocytosis. Phagocytes have a potent cytotoxic capacity induced by antibodies against target cells (e.g., pathogens and tumor cells), known as antibody-dependent cell-mediated cytotoxicity (ADCC). These antibodies activate Fc receptors to trigger signaling pathway that induces Ca2+-dependent lysosomal exocytosis. Notably, neutrophils have particularly strong ADCC activity, during which they secrete large amounts of cytotoxic molecules, including hydrolytic enzymes, oxidative metabolites, and host defense peptides such as defensins. It would therefore be useful to study whether myoferlin also regulates the release of these molecules from neutrophils. Moreover, our demonstration that myoferlin deficiency decreased the cytotoxicity of phagocytes is clinically important and may facilitate the development of novel therapeutic approaches based on myoferlin-mediated lysosomal exocytosis. Myoferlin is a protein expressed on the surface of lysosomes and auto-lysosomes which binds phosphatidylserine in the inner leaflet of the plasma membrane upon calcium stimulation. 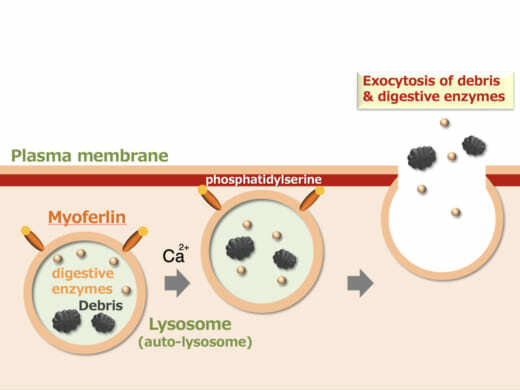 Thus, myoferlin promotes the fusion of lysosomes with plasma membrane for lysosomal exocytosis of debris and digestive enzymes. 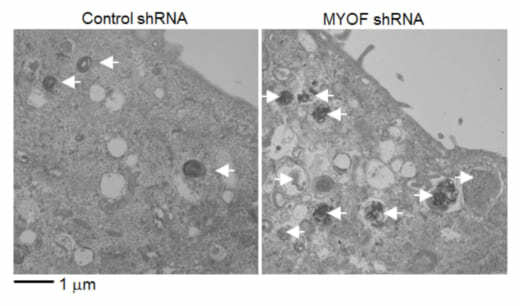 Electron microscopy analysis of cells expressing control shRNA or myoferlin (MYOF) shRNA. Autolysosomes carrying debris (arrows) accumulated in myoferlin knockdown cells, but were rarely found in the control cells. Intraperitoneal injection (i.p.) of Escherichia coli (E.coli) BioParticles induced the secretion of lysosomal enzymes by peritoneal exudate cells in the peritoneal fluid (ascites), which was significantly reduced in myoferlin knockout mice (left). Accordingly, cytotoxicity of the ascites, as determined by survival of target tumor cells, was not observed with the ascites from myoferlin knockout mice (right). This work was supported by grants from the Japan Science and Technology Agency, Precursory Research for Embryonic Science and Technology (PRESTO) “Chronic Inflammation” (4336), the Ministry of Education, Culture, Sports, Science and Technology Grant-in-Aid for Challenging Exploratory Research (16K15231) (to R.H.), and by the World Premier International Research Center Initiative, Ministry of Education, Culture, Sports, Science and Technology, Japan.